Giuseppe Sciuti (1834–1911), Titus Quinctius Offers Liberty to the Greeks (1879), oil on canvas, 83 x 195 cm, location not known. Wikimedia Commons. There aren’t many paintings of either Philopoemen or Titus Flaminius, from Plutarch’s Lives, but as two of them are by Rubens, are in major collections, and are fascinating, I will condense their biographies into this single article, to make sense of the art. Philopoemen was the orphan son of the illustrious Craugis of Megalopolis, who was brought up by Cleander. When he was a general, Philopoemen was expected as a guest at a house in Megaria. With her husband out, the lady of the house set about preparing for her guest. When Philopoemen arrived, he was wearing an ordinary soldier’s cloak; his hostess mistook him for one of the general’s servants, so put him to work splitting firewood for her. The woman’s husband, Titus Flaminius, then arrived and recognised Philopoemen, so asked him what this all meant. Philopoemen replied humorously that he was perhaps paying the penalty for his ill looks. 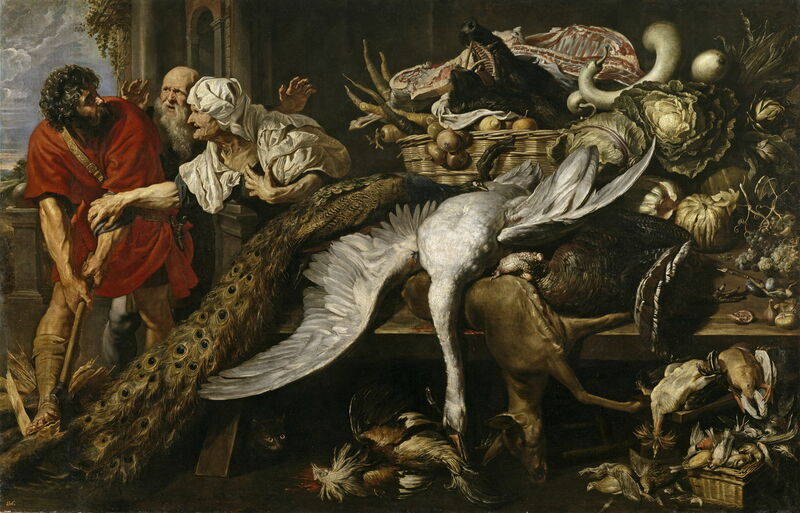 Oddly, it is this single and rather dubious story about Philopoemen which inspired two wonderful paintings by Rubens. Peter Paul Rubens (1577–1640) and Frans Snyders (1579-1657), The Recognition of Philopoemen (c 1609), oil on canvas, 313.5 x 201 cm, Museo Nacional del Prado, Madrid, Spain. Wikimedia Commons. The earlier of the two, The Recognition of Philopoemen from about 1609 and painted with Frans Snyders, now in the Prado, Madrid, is the more finished. Titus and his wife are shown as being very old, although in fact Philopoemen was probably just over twenty years older than Titus. 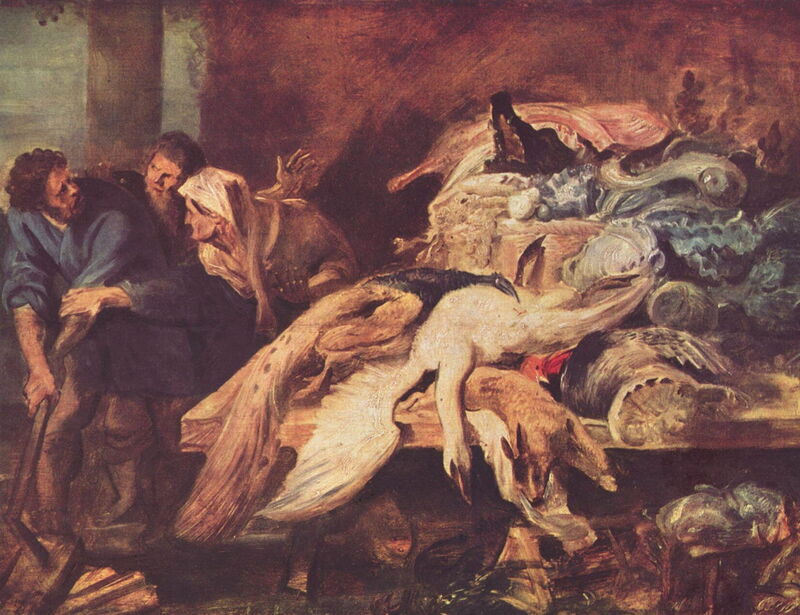 The fare they have brought in is lavish by any standards: there’s a swan, a peacock, and piles of other game. Under the table is a black cat, its eyes gleaming bright. Peter Paul Rubens (1577–1640), Philopoemen Recognised by an Old Woman (c 1616-18), oil on panel, 50 x 66.5 cm, Musée du Louvre, Paris. Wikimedia Commons. It is claimed that a few years later, Rubens painted the much smaller and more sketchy Philopoemen Recognised by an Old Woman (c 1616-18), which is now on the other side of the Pyrenees in the Louvre, Paris. I’d rather suspect that this was the earlier, and had been a preparatory study for the finished version now in the Prado. Both seem to be quite closely related to the spectacular series of the Five Senses, painted by Rubens between 1617-18 jointly with Jan Brueghel the Elder. Philopoemen was fond of a soldier’s life from his youth, and possessed fine military skills. He first took part in incursions into Spartan territory, then at the age of thirty he helped the defence of Megalopolis against night attack by Spartan forces under King Cleomenes. During that action, he fought intelligently and bravely, and was wounded severely in both thighs by a javelin. This earned him high repute, and he honed his skills of warfare on the island of Crete. On his return to the Achaeans, he was put in command of the cavalry, where he soon distinguished himself in battle against the Aetolians and Eleians at the river Larissus. Philopoemen changed the Achaean forces considerably, making them much stronger at a time when Greece was militarily quite weak. Sparta was trying to gain control over the whole of the Peloponnesus, but Philopoemen and his army defeated them, and killed Machanidas, the tyrant of Sparta, in battle. This was commemorated in a bronze statue of Philopoemen set up at Delphi. However, he was then summoned to lead the Gortynians as their general on Crete; while he was away, Megalopolis was under almost continuous attack, and his absence left its defence very weak. As punishment, it was proposed to send him into exile, but the Achaeans prevented that. When Philopoemen returned from Crete, Philip of Macedon had been defeated by Titus Flaminius, and the Achaeans and Romans had become allies to fight Nabis and his Spartans. Philopoemen was immediately engaged as a general by the Achaeans, and won a major victory over the Spartans. Titus Flaminius was jealous of the recognition which he gained for that success. Sparta fell into confusion, allowing Philopoemen and his cavalry to attack; this forced the city to become a member of the Achaean League – which was a remarkable and important achievement. When he was seventy years old, Philopoemen again found himself general of the Achaeans, but was suffering the effects of age, and bouts of illness. Messene tried to revolt from the Achaean League, and Philopoemen rushed to defend a village from attack. While ill, he was thrown from his horse, and was captured by his enemy. Philopoemen was confined in an underground prison known as the Thesaurus, with no windows and a huge stone for its door. William Rainey (1852-1936), Philopoemen in Prison (c 1910), colour lithograph in W.H. Weston, ‘Plutarch’s Lives for Boys and Girls’, London. Wikimedia Commons. 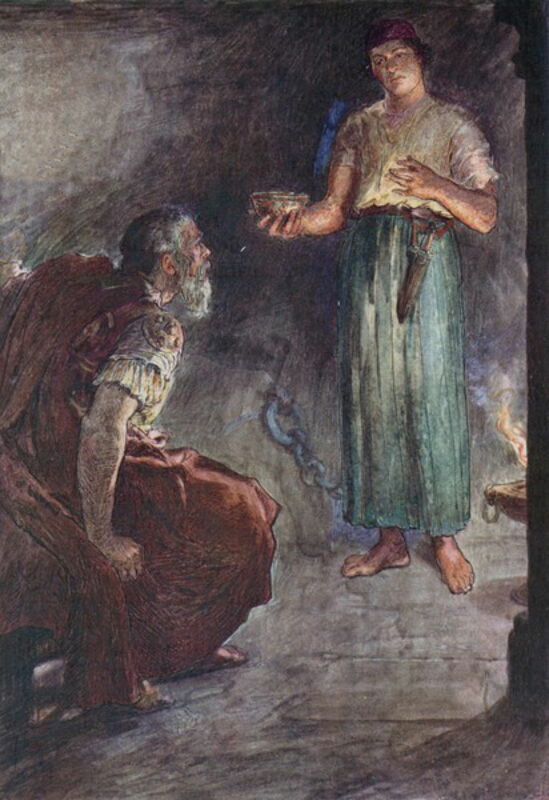 William Rainey’s colour lithograph of Philopoemen in Prison from before 1910 shows Philopoemen being given a cup of poison to drink, which killed him there in the Thesaurus. He was later buried with full military honours, and remembered in many statues around Greece. Titus Quintius Flaminius (Quinctius, or Quincticus) was also brought up as a soldier, and first served as a military tribune under the consul Marcellus against Hannibal. Marcellus died in an ambush, and Titus was made governor of Tarentum, which established his reputation. He was elected consul before he was thirty, and was sent to lead the Roman forces against King Philip of Macedon. Unlike his predecessors, Titus intended a short and effective campaign. When he came upon the Macedonians, he ambushed them in a pass, and discovered that Philip was driving the inhabitants of Thessaly into the mountains, burning and looting their cities. Titus responded by telling his men to respect the locals, and win them over to the Romans, which proved very effective. Titus attempted to negotiate with Philip, but the latter would not withdraw his garrisons from Greek cities. The Romans then won over the support of much of the rest of Greece, but Philip remained obdurate, even sending ambassadors direct to Rome to try to negotiate a better deal. Titus was supported by the senate, who agreed that he should continue his campaign against the Macedonians. Their large armies, of over 26,000 each, engaged near Scotussa. The Romans got the upper hand in the battle, killing eight thousand Macedonians and taking five thousand prisoners, but Philip himself managed to escape. Eventually, Titus achieved peace by returning the kingdom of Macedon to Philip, but requiring him to keep away from Greece. The senate provided Titus with ten commissioners, who were to supervise the freedom of Greece, with three Roman garrisons. 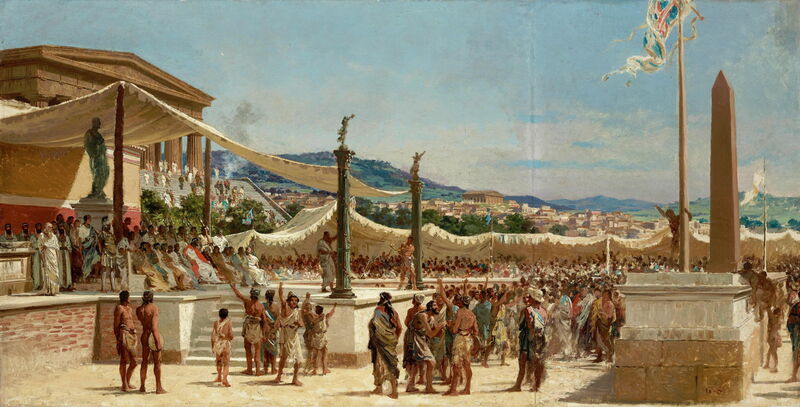 At the Isthmian games, Titus was formally proclaimed proconsular general, and Greece made free within Roman supervision. This slowly brought a huge roar of approval from the spectators. Jean Pierre Saint-Ours (1752-1809), Titus Quincticus Flaminius Granting Liberty to Greece at the Isthmian Games (1780), brown ink and wash, heightened with white ink, over black chalk on yellow-tan paper, 35.4 x 71.9 cm, Los Angeles County Museum of Art, Los Angeles, CA. Wikimedia Commons. Jean Pierre Saint-Ours’ Titus Quincticus Flaminius Granting Liberty to Greece at the Isthmian Games from 1780 is a fine drawing of this event, which sadly doesn’t seem to have survived in any finished painting. John Leech (1817–1864), Flaminius Restoring Liberty to Greece at the Isthmian Games (c 1850), illustration in Gilbert Abbott A Beckett, ‘The Comic History of Rome’, Bradbury, Evans & Co, London. Wikimedia Commons. 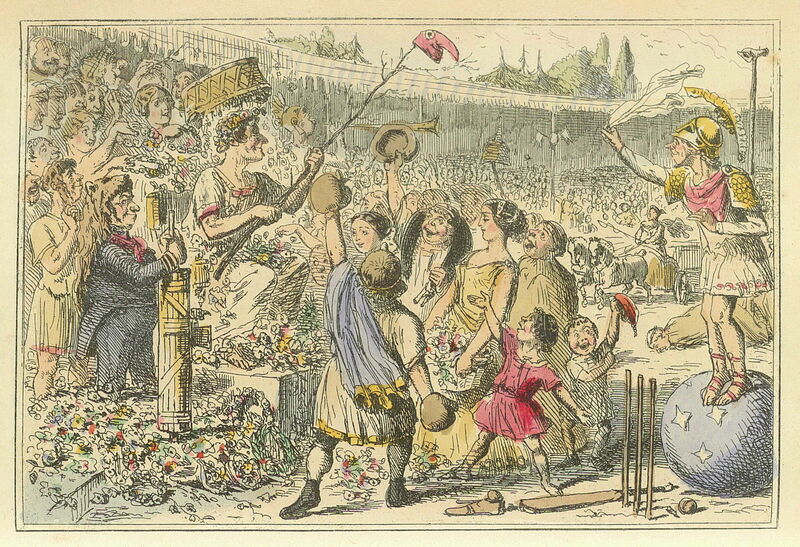 John Leech also turned it into the parody of Flaminius Restoring Liberty to Greece at the Isthmian Games in about 1850, as one of his illustrations in The Comic History of Rome. But the most wonderful painting of it is Giuseppe Sciuti’s Titus Quinctius Offers Liberty to the Greeks from 1879. Sciuti was never a pupil of Gérôme, but seems to have had a similar liking for realist depictions of grand events in classical Greece and Rome. If this is anything to go by, we should perhaps unforget his work quickly. Titus then made peace with Nabis, the lawless tyrant of Sparta, which disappointed other Greeks who had wanted him to be captured. Later, Antiochus entered Greece, and stirred its people to revolt against the Romans. Titus was made lieutenant to Manius Acillius, who was sent as consular general to tackle this. As the Greeks had great affection for Titus, this brought strong support for the Roman cause, and Antiochus was defeated at Thermopylae. Titus was then appointed censor, as the culmination of his career. At the time, Scipio Africanus and Marcus Cato were the most influential people in Rome, and opposed to one another. Titus appointed Scipio to be Dean of the Senate, but couldn’t make good relations with Cato. Titus fell into disfavour because of his treatment of Hannibal, who took his own life following his defeat and fall from power. Titus retired from public office, and died later, in peace. Philopoemen, whole text in English translation at Penelope. Flaminius, whole text in English translation at Penelope. Posted in General, Life, Painting and tagged biography, history, Leech, morality, painting, Plutarch, Rainey, Rubens, Sciuti. Bookmark the permalink.